The Picardy province in France lies just south of the Nord-Pas de Calais region in the North of the country, and it is most famous for being the site of the Battle of the Somme in 1916. Apart from that, however, today’s Picardy is a very attractive region boasting lovely brick-built villages, champagne vineyards, public gardens and parks and the six cathedrals of Picardy. The latter encompass pretty much the entire history of gothic architecture, of which it is considered the birthplace. The largest cathedral in France (145m long, 45m high) stands in Amiens and was completed in 1288. Its façade has since been restored, but still represents a great example of the intricacy and splendour of Gothic buildings. Amiens was also the birthplace of Maximilien Robespierre (1758 – 17974), the revolutionary who was guillotined after being accused of dictatorship. The Quartier St Leu on the Somme riverbank has a fantastic, almost medieval flair and some great restaurants. The old puppet theatres scattered around the town are also worth a look, if only for some nostalgia about 3D-glasses-free entertainment. The hortillonages or floating market gardens going off the small Somme canals are an absolute treat, especially when explored via punting. In the Aisne department lies Saint-Quentin, a mid-sized city with great weekly markets (Wednesday, Saturday and Sunday), a must-see gothic basilica and a lovely butterfly museum. 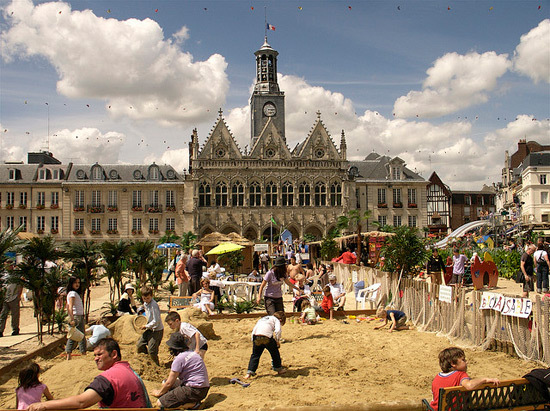 Picardy is probably best explored by car, driving from town to town and taking in the scenery and stopping off to enjoy local delicacies such as the almond macarons in Amiens. To start off your tour around this gorgeous region of France, you can take a P&O Ferry from Dover to Calais, from where it is only 74 miles or an hour and a half’s drive to Amiens.